From serving as a consultant to law enforcement to collaborating with Firefox on a cookie-blocking feature, Jonathan Mayer J.D. ’12 Ph.D. ’16 has made a name for himself in recent years with regards to technology policy and online privacy issues. 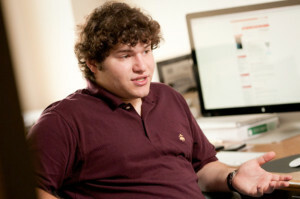 Despite being recently named as one of Forbes Magazine’s “Top 30 Under 30,” however, Mayer framed the public plaudits as simply a way to ensure that his work continues to influence public debate well into the future, noting that even being considered for the Forbes nomination had been a surprising—if entirely positive—experience. “It’s one of those things where you don’t really ask for it or expect it, but it’s really nice to get it,” he said. A native of Chicago, Mayer earned his undergraduate degree in public policy from Princeton University in 2009 and came directly to Stanford with the intent of completing the first ever J.D./Ph.D. in computer science (CS). Even while working towards his law degree, Mayer split time between Law School classes and CS research. His research in tech policy, an area that Mayer describes as “the ACLU [American Civil Liberties Union] for technology,” has led him to work on issues related to Google’s cookie-tracking policy online, phone metadata privacy and the NSA’s international tracking, among others. He framed his interest in those fields as reflective of not only personal curiosity but also a desire to educate the public about how their data is used. In fact, Mayer began looking into cookie tracking at about the same time that the Federal Trade Commission (FTC) began their investigation into Google. The FTC acknowledged looking at Mayer’s research throughout their investigation, which eventually resulted in a $22.5 million fine for the Silicon Valley giant. Mayer framed the cookie-tracking issue as presenting significant implications for the general population. Patrick Mutchler Ph.D. ’16, whose research interests involve mobile security, began working with Mayer this past summer on the phone metadata privacy research. “[Mayer] is a unique researcher because having a J.D. with a Ph.D. gives him some expertise that few people have, even at Stanford,” Mutchler said. “He’s working on things that have an obvious direct influence on people, which is not something you see as a researcher. It’s harder to come up with things that have a direct influence right away. For Mutchler, the most unexpected part about working with Mayer was the practice of publishing their preliminary results on Mayer’s blog, which is followed by various news media. For Mayer, one of the hardest parts of trying to push back against technology giants like Google is seeing the limited impact of his information and research on policy debates. Mayer also expressed frustration with the media’s lack of nuance, an issue particularly pronounced in recent investigations into the National Security Agency’s information-gathering practices. For Mayer, the need to function as a pseudo-ACLU for technology issues is symbolized by the enormous asymmetric exchange of information in the tech industry. Contact Josee at jsmith11 ‘at’ stanford ‘dot’ edu.